Sustainable Christmas has never been that convenient - simply order your tree online, pick your size, date for delivery and pick up andwe'll deliver your real live Christmas tree straight to your home! Sizes include the plastic pot in which the tree is being delivered. Prices include VAT, pickup and delivery. You can either pay online via Paypal right after placing your order, or we'll send you an invoice within 24 hours by e-mail. Like every other pland, your Christmas tree will need to be watered and some additional care. You will find instructions on the badge on the tree and here. Want to keep your tree? After Christmas you can also choose to keep your tree at no additional cost. Plesae just notify us by e-mail that you don't need a pickup. 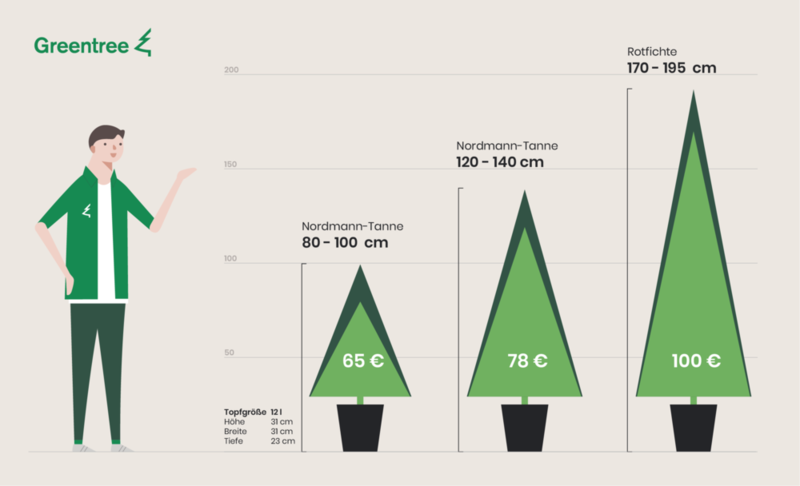 We currently deliver trees in Vienna and surrounding area and Graz. Deliveries are made from 01.12. to 22.12. Several days before the delivery we will notify you in which times slot (3-4 hours) your tree will be delivered. After Christmas its back to the forest! You can choose your pickup period when ordering. You don't need to be present for the pickup, if your house can be accessed with a postal key. Just leave your tree in front of your apartment door. If your living in a detached house, you can leave your tree at the entrance for pickup.